St. Paul's Important Church Announcement As of a special meeting on December 2nd it was voted on by the members of St. Paul's to sell the Church properties. At this time they have two prospective buyer's, and both have plans to keep all the youth groups in place at the Church. What does this mean for our program? 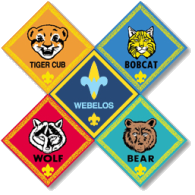 Troop 94 and Pack 94 will continue with business as usual in the Scout room. IMPORTANT PLEASE READ All, Scouts is cancelled for tonight, however the Pellman cake order pickup is STILL ON for tonight from 6-7 pm, in the vestibule of the church. (behind big red doors) In the event that you are unable to pickup tonight, we will make someone available tomorrow evening in the Scout Room. VERY IMPORTANT...if you cannot make it tonight...PLEASE contact Ashley Millard as soon as possible and let her know that you cannot. Everyone should have received an email and text with contact info a few moments ago. Hoagie Pickup 9-19-18 All, Hoagie order Pickup is tomorrow Wednesday evening from 4:30 to 5:30 pm 9-19-18 at the entrance to Fellowship Hall...through big red doors. If alternate arrangements need to be made, check your email and contact the Cubmaster.